If you dare get into the ocean to kick off 2018 you will experience a form of it: first the agony, then the numbness, then the tingling, then the giddiness, then an utter lack of ability to move ones limbs. Then death, usually. I don't know what to compare that to, but it sounds kind of fun. Who is in the mood for a polar plunge? Swimming humans risk hypothermia anytime water and air temperature combined do not add up to 100 degrees Fahrenheit. Ocracoke forecasters predict a below freezing, windy day on the first day of the new year. The ocean is also a bit colder than it recently was. The math is not in our favor. At last years plunge it was hard to get out of the water. This year it's doubtful who, if anyone, will get in. Stalwart plungers Joan and John Crowe said they were not willing to be that cold, nor risk death. Lets go swimming later this spring, they suggested. Knowing the risks, I will still suit up, dress in wool and synthetic layers, and act as if I might run in. I plan to ride across the airport ramp around 1 or 2 pm and look at the ocean. If I don't get in, it will be for lack of courage, or prevalence of sense. It gets viciously windy on Ocracoke, and I'm no hero. We shall see. Yet I love jumping into cold water. There is a cusp between surprisingly energized and incredibly stupid. When cold water starts to feel relaxing and inviting, it's past time to get out, and instantly time to get warm and dry. And warm. Racing in and straight back out for a bracing tingle is good too. Is this the year we construct a sweat lodge on the beach? Anyone good at fashioning shelter? I won't organize it, but I'll certainly suggest it. Where are the river rocks for us to heat in the fire? Who has the beach fire permit? Does anyone own a portable sauna they could set up? Everyone and anyone is welcome. Common sense is required. 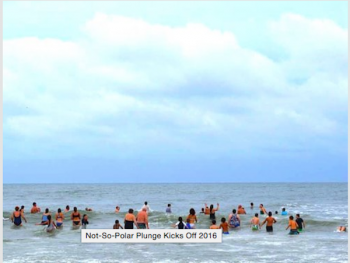 The unofficial, freeform, not-sponsored-by-anyone, annual Ocracoke Polar Plunge will be Monday, January 1, 2018 at 2pm-ish at the airport beach/ramp 70. Enter at your own risk. Happy New Year!